TL;DR: Rate of slime usage in farm tile does not affect rate of germ loss. This results results on average 6000x (okay, 5927x) as many germs being released to the atmosphere. All this means that the at most 1333 mg of unused slime remaining in the farm tile would contain 35,559 germs, which is 26,669 germ/g slime. 26,669/4.5 = 5927. Sure, sure, this is all 'hypothetical', right? ABSOLUTELY NOT! 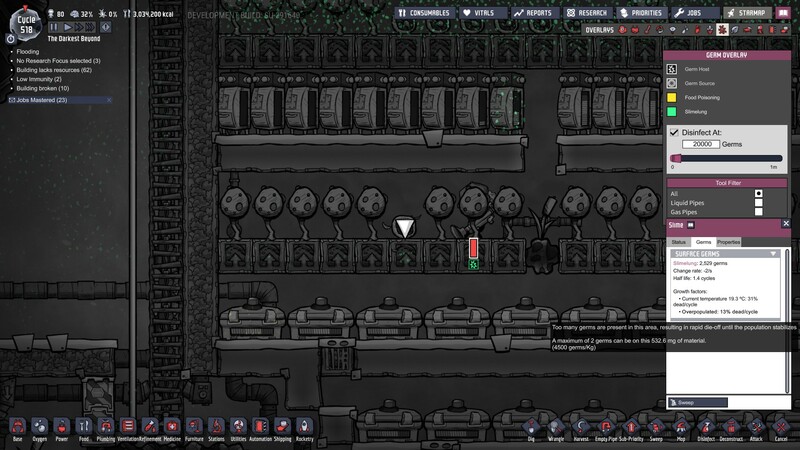 After my large mushroom farm ran out of slime, I decided to dig up the growth halted dusk caps and reclaim the space, when I noticed 35 of my 80 duplicants came down with slimelung in a matter of minutes. Mind you, no one had come down with slimelung before this so germs were well under control. What happens is that when the very small, very germ concentrated amount of slime is exposed to a low pressure atmosphere, it will instantly convert the entire mass to polluted oxygen as well as all of the germs. A concentrated explosion of germs as you can see in the below screenshots. I also included the save files after (The Darkest Beyond) and just before the outbreak (Just_before). My suggestion would be to decrease the germ count proportional to the reduction in slime as the slime is consumed by the dusk cap. Right now the slime is consumed, but the germs are not. Slime should have no more than 2 germs, but instead has 2,529 germs. The CO2 became super concentrated. The selected tile of CO2 should have 6,380 germs, but instead has 101,547. Just FYI, there's a good bit of other unrelated chaos happening with my base during these saves. I was able to make enough medbeds, I'm going to try and make my way through this! As always, love this game! Thanks Klei. Use highly germy slime on farm tile, after 3 cycles and with a little unused slime left in the farm tile, uproot the dusk caps. 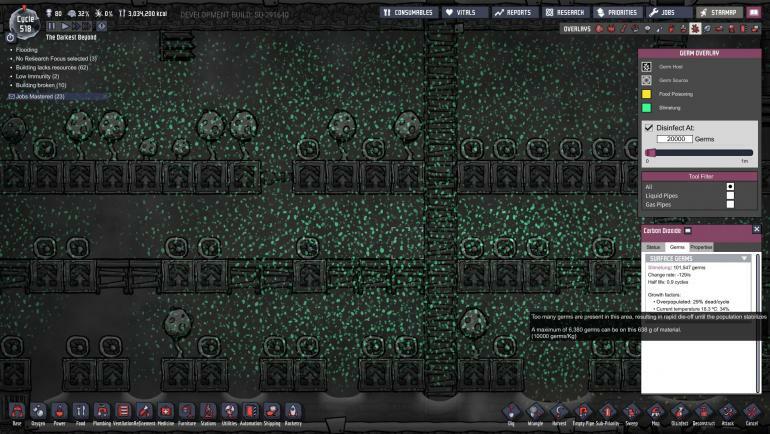 Dropped slime will instantly sublimate to polluted gas containing an excessive germ count and infect everyone! (please see issue description for more detail). Had this happen again, nearly lost my colony by destroying a few farm tiles in my mushroom farm.